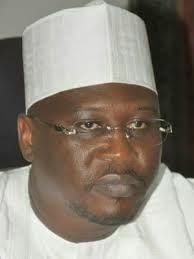 The lingering crisis of the Adamawa State House of Assembly has deepened as 9 out of 25 members of the legislature sat on Tuesday in the conference Hall of Government House,Yola, to remove the Speaker of the Assembly, Alhaji Ahmadu Umaru Fintiri and his Deputy Barrister Kwamoti Laori out of office. The ouster came after a parallel sitting at the House of the Assembly complex in Yola, presided by Fintiri, where 10 members including the Speaker also sat . At the plenary session the Speaker said six members of the Assembly were absent with the leave of the House, while he said others were absent without permission and the house was yet to be abreast of the reasons for their absence. The house has since adjourned its sitting to Wednesday 29 April ,2015. However, before then, 11 aggrieved lawmakers had issued a press statement accusing Fintiri of high-handedness and unilateral closure of the house which lasted for weeks and issued a warning to the effect that by that action they have no alternative other than to convene the sitting elsewhere. Prior to the just-concluded March/April general election in the country, the house of assembly had gone on a three-week recess to allow members participate in the electoral process. But a day to the opening of the house after the recess has elapsed, 11 members allegedly loyal to Governor Ngilari issued a press statement expressing their grievances with the leadership style of the speaker and threatened to effect a leadership change in the house. As the crisis deepens, 9 out of the 11 aggrieved lawmakers Tuesday convened a sitting at the conference hall of the government house where they removed the speaker and his deputy from office. As the plenary session of the 9 lawmaker began at the Yola Government House, member representing Gombi constituency Hon Jerry Kumdisi moved for the appointment of Honourable Wale Fwa as Protem speaker and was seconded by member representing Girei constituency Abubakar Umar Girei. While leading the session, the Protem speaker Fwa noted that the reason for convening of the session follows consistent refusal of Fintiri to open the house after series of entreaties made to him fell into deaf ears. She added that majority of the lawmakers have lost confidence in the leadership of Fintiri as a result of which 17 lawmakers representing 2/3 of the lawmakers duly singed for the impeachment of the speaker and his deputy. "All the members who signed the impeachment notice have resolved to remove the speaker and his deputy," she noted. It was at that point that member representing Verre constituency Hon. Salihu Kabillo moved for the impeachment of the speaker and his deputy leading to the removal of Fintiri. After the removal Kabillo again moved for the nomination of Hon. Jerry Kumdisi as the new speaker of the house and was seconded by member representing Yola South, Hon Abuzarri Ribadu. In his inaugural speech, Kumdisi promised to end the era of impunity as was entrenched by Ahmadu Umaru Fintiri's leadership which led to his eventual fall. He promised to work in harmony with the executive arm of government as the relationship was earlier frosty which affected the people of the state. Kumdisi accused some of the lawmakers who failed to turn up for the impeachment as cowards, saying despite their withdrawal, the decision to impeach the leadership of the assembly remained sacrosanct as their signatures were duly appended and acknowledged. He said the people of the state know who their representatives are and called on the media to safeguard the truth and the Constitution of Nigeria. Fintiri said the action of the members is a nullify as they did not follow the rules and guidelines of the house . “If they are right, they ought to come to the floor of the house and effect my removal, not at the government house,” he said.